Sorry they're not open Sunday -- was looking forward to the Bulgogi dinner. While that thread indicates them opening last December I had visited late in the summer last year. Good, fresh sandwiches (kinda Bánh Mì like, maybe lighter) and owners as nice as can be and giving it a go as hard as they can. I would stop again if in the area and if I wasn't in the mood for a greasy hamburger at Jim's Hamburger Heaven. I completely agree with the post above that the owners are really giving it all they've got. Their sandwiches are really very good and never overly seasoned or drowning in mayo/dressings...just nice and fresh. I think there may be some pics in the professional forum thread linked above. Zenwich is very easy to get to. From 290 you can exit York Road and go south about 1/2 mile. You may also exit from 294 and take North Ave West and take a right(north) on York. The restaurant is in a strip mall on the west side of York. I made it to Zenwich for lunch today. I got the Bulgogi sandwich. It was pretty dang good. 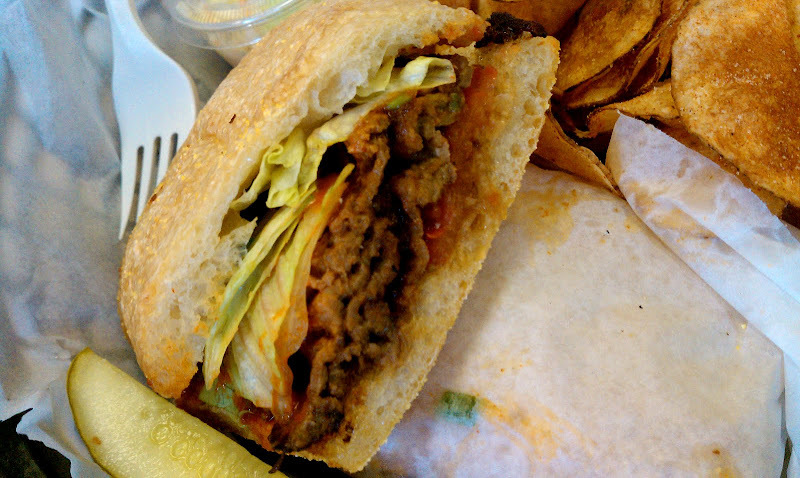 Tender, flavorful beef on a nice and crispy ciabatta roll. The housemade chips with some sort of spicy bbq seasoning. Cole slaw had lots of ginger in it and wasn't overdressed. There are quite a few other sandwiches that look good too. I'm definitely going to have to go back. Brisk business between 12 and 12:45. 6 or 7 people eating in and a few people doing carry out. It was a ghost town when we first got there though. It's not much to look at from the outside, but it's a nice space inside with seating for probably 20 people. we went a couple of weeks ago for the first time and I forgot to post. We really liked it as well. We were there around 2 maybe, and were the only ones there, but the people were really friendly and the sandwiches were really good. We'll definitely go back when we're in the area. cucumber, red onion, jalapeno and cilantro with homemade mayonnaise). This was really really good. All of the ingredients worked in harmony for a well balanced sandwich. Juicy pork with a nice crust, crunchy cucumbers and red onion, a good spicy bite from the jalapenos. I'm glad to have read about this place and to add it into my regular lunch rotation. Had what the previous poster had today, my first time at Zenwich. Agree that the Mu Ping is a great sandwich, and I also enjoyed the homemade, well-seasoned chips that came with my sandwich. I'll definitely be back! Give the pork katsu sandwich a try next time, it's another winner. I usually order one pork katsu and one mu ping when I go. Can't decide which I like better....so we get both and my husband and I share. I personally don't care for crab, but I've had three different people recommend the crab cakes to me, so that might be another good pick. A while back, I posted in another thread that I didn't like their 'dinner boxes' as much as I did their sandwiches. I still think the sandwiches are where they really shine, but I tried the bibimbob dinner a couple of months ago and liked it a lot. I'd never had that dish before, so I can't compare it to other restaurants, but it was all very fresh and had a nice balance of meat and veggies. It could have been hotter/spicier, but I generally like things spicier than most people I know. Soups are good, too, as is the ginger salad dressing. Went back for lunch today and tried the Pork Katsu. Another winner. Crispy panko crusted pork with the ginger cole slaw and a Japanese bbq sauce. Also good to see them get some positive press in the Tribune today. Kevin Pang did a nice write up. I just called to place an order and Nate, one of the owners, mentioned that Zenwich will be on the Hungry Hound! November 26 at 10pm. Channel 7. Very happy to see them getting more positive press. I just discovered their Facebook page, where they post their daily soup specials. I feel lucky to have an interesting place like this here in the suburbs and think Zenwich would have an even bigger following if they were located downtown somewhere. I went to Zenwich for the first time today for lunch, and was glad I did. Nice service and great food in a small but comfortable enough (for me, at least) dining area - I will definitely be back for more. I tried the soup of the day, which was Hot and Sour. It was a fairly good rendition, although could have used a little more of a kick (both with some spice and maybe a little vinegar). The sandwich I picked was the Crab Cake, and it was excellent. The crab cake itself was fairly big, and the watercress on top gave it a really nice and fresh crispness. But it was the creamy garlic sauce which pulled it all together, and the ciabatta roll held everything in place without being overpowering. It also came with well seasoned homemade potato chips and a nice take on cole slaw salad which had ginger in it. One of the owners, Nate, was extremely nice and mentioned that business was slowly picking up, and that he hoped the upcoming Hungry Hound mention may help (as foretold by tavogels). If you happen to be near Elmhurst, I suggest you also do your part and get a sandwich there; you won't be disappointed. I am glad to see this place reviewed here. I saw a Steve Dolinsky segment on this place last night, I wondered why I had not gone yet or knew of its existence. Probably because Elmhurst is not where I usually travel, I didn't give this a whole lot of thought. I will have to adjust my thinking on this. Had a very enjoyable lunch here today. Housemade chips are good, and I enjoyed the seasoning. My mu ping sandwich was quite good, and I'll gladly pick up another after working through the menu further, but the clear winner for today was the pork katsu my wife opted for. Most of the seating was in use when we arrived, and one of the owners mentioned that they were out of a number of things as the Dolinsky effect had been evident from the moment they opened today. Great little place, and I hope the boost in business last for them. I very much enjoyed the mu ping sandwich: great bread, fresh vegetables and cilantro, moist pork, hint of garlic in the sauce. The cucumber salad which is a sandwich topping (and also a side) could probably benefit from draining before incorporation - my order was dripping - but the overall balance in the sandwich was nice, and the scale just right for the price. Hot and sour soup was perfunctory but, again, tasted quite fresh; the chips are very tasty as mentioned by James and others upthread. Zenwich has a fun WasCish welcoming, confidently experimental vibe that I'd like to see more of along that stretch of York. Zenwich has been nominated here for a GNR Award. Please discuss the nomination here. Love this place, from the food to the friendly counter service. Wish it was somewhere closer, or at least more convenient, but I must admit I stocked up when it was offered on Groupon. I will make excuses to go here. Added bonus: home made chips and (as far as I could tell) possibly cooked to order chicken fingers for the kids. I was expecting the worst, but they got the best. I completely support this nomination - I'm actually disappointed that I was so distracted by my current business trip that I didn't get to make the nomination myself. I've been back several times since my first visit, and Zenwich has never disappointed. 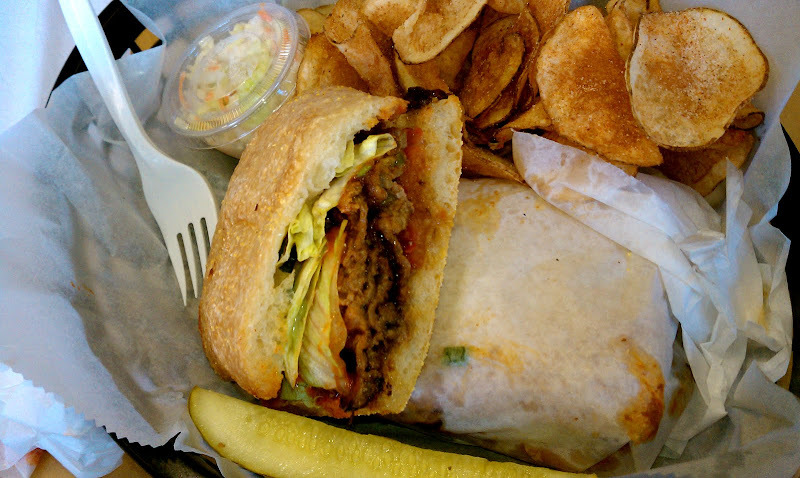 Not only is it my first choice by far for a meal in that area of Elmhurst, I find myself rationalizing things like a trip to the Woodfield Mall for shopping that could be accomplished in other ways just because we can stop at Zenwich on the way there. Love the chips, which have been mentioned often. Every sandwich I've tried has been good. They're well-balanced, with flavorful components that really complement each other nicely, highlighting ingredients that I don't typically see used for sandwiches. The owners are very welcoming, very friendly, and I wish nothing but greater success for them. In the last year or two Oak Park has seen a new Brazilian place open 2 blocks from my home, a Venezuelan arepas joint, and the long-awaited opening of Chicago's Home of Chicken & Waffles, and while I've found things I enjoy at each of them, I'd happily trade all three to have Zenwich here and that much more accessible to me. Most amazing thing about Zenwich? The zenwich.com address remains unclaimed! I've been to Zenwich quite a few times over the last six months and each time the food was consistently delicious. The flavor combinations of the sandwiches are excellent. I happily support Zenwich for a GNR. Well-deserved nomination. The only problem is that they consistently have their banh mi off the menu since they can't locate the proper Vietnamese cold cuts. He'd rather not sell it than substitute something not authentic. chainey wrote: Well-deserved nomination. The only problem is that they consistently have their banh mi off the menu since they can't locate the proper Vietnamese cold cuts. He'd rather not sell it than substitute something not authentic. Frustrating, perhaps but a very good sign, IMO. I'm almost never out this way. Is it worth a dedicated trip from the Deerfield area? It's not too far from Katy's in Westmont (20-25 minutes), so it would be worth a combo trip imo. Appreciation to their commitment to quality is what I meant to imply. Just really wish I could get their Bahn Mei more often! Can anyone tell me how well the sandwiches travel? I've only ever eaten in. Vitesse98 wrote: Can anyone tell me how well the sandwiches travel? I've only ever eaten in. They travel great. I've actual never eaten in. The place is kind of small and kind of cold in winter so I just go home, about 15 minutes away. I've also rode my bike and put the sandwich in my backpack. So yes, they sandwiches travel well, imho. I stopped by the restaurant hoping to get their Bánh Mì sandwich. It was on their board, but they said that the meat which was delivered that day for the sandwich was too fatty. They were supposed to get better meat later in the day. The mu ping sandwich and the chicken satay sandwich were both good (but not good for small children as they dripped a lot and were hard for them to hold together). The dining area is no frills. I am guessing that most of the business is carryout. I had a meeting out in the vicinity of Elmhurst, so I decided to grab a couple of sandwiches. I appreciate what they are trying to do at Zenwich. I really do. The husband and wife team that owns the joint was as nice as could be when they saw me staring at the menu, trying to figure out what I should order. They were super friendly, clearly proud and excited about their business, and eager to make recommendations. All of this was promising. Unfortunately, the food just didn't live up to the promise. We had the Mu Ping sandwich (grilled pork, pickled carrot and daikon, cucumber, red onion, jalapeno, cilantro, sweet mayonnaise). 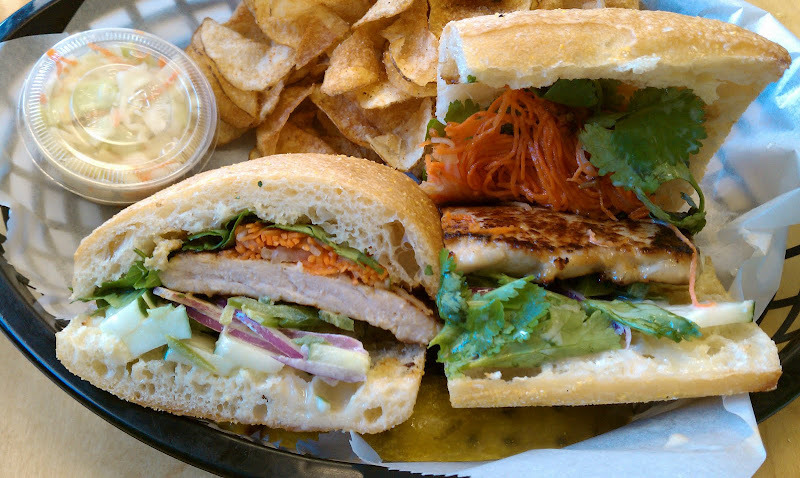 It's hard to improve on the classic grilled pork banh mi, and this sandwich failed to do so. Again, skimpy on the meat, and the meat and toppings just lacked the flavor and zing that I expected. Next up, the pork katsu sandwich (panko crusted fried pork cutlet, coleslaw, baby greens, Japanese BBQ sauce, and mustard). I was really excited about this one, but again, I was disappointed. The pork cutlet was so very very thin. And tough. And the tonkatsu sauce wasn't quite right. Oh well, another miss for me. The soba noodle salad was mushy and bland. We didn't finish it. The slaw and chips were fine, but again, unremarkable. There are two possible explanations for how disappointed we were with the food. First, everything but the crab cakes had to travel from Elmhurst to the Loop. That couldn't have helped. Second, and I believe this is the more likely reason, is that Ronna and I know what the inspiration foods for these sandwiches are supposed to taste like. The Mu Ping just wasn't anywhere near as tasty as a good old Nhu Lan #4. The pork katsu sandwich was a pale imitation of a pork tonkatsu at Renga-Tei or Tampopo. I don't know if Zenwich is aiming for gussied up or dumbed down, but either way, I think that they are missing the mark. I hate to say it, but I can't support Zenwich for GNR. Your particular issues certainly may transcend the caveat, but an Elmhurst to loop trip seems a pretty long wait between short-order prep and eating. Was it 45 minutes, door to door? Longer?